Wise assorted entrees are second to none. Each individual packet contains four servings of quick cooking gourmet entrees. 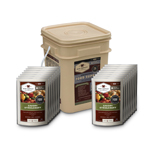 With a shelf life of up to 25 years, this package is a Wise recipe for any type of emergency, not to mention everyday use. Just add the contents to boiling water, stir, shut off the heat and wait. These meals require very little energy to cook, since there is no need to continue cooking after mixing the contents with water. You'll be surprised at the taste of these meals! 8 servings each of Savory Stroganoff, Cheesy Macaroni, Pasta Alfredo, Creamy Pasta and Vegetable Rotini, Teriyaki and Rice, Creamy Ala King and Rice, Tomato Basil Soup; and 4 servings of Cheesy Lasagna.